Making it impossible to run VisualEditor on the beta-cluster. P1847 Failed to execute 'write' on 'Document': It isn't possible to write into a document from an asynchronously-loaded external script unless it is explicitly opened. T107979: [Regression pre-wmf18] VisualEditor doesn't load, throwing "Uncaught TypeError: Cannot read property 'requestPageData' of undefined"
Josve05a added projects: Beta-Cluster-Infrastructure, MediaWiki-General-or-Unknown, VisualEditor. Josve05a moved this task to To Triage on the Beta-Cluster-Infrastructure board. I Ithink it is a bug in MediaWiki-extensions-MwEmbedSupport causing problems with VisualEditor, but only in the Beta-Cluster-Infrastructure, but don't quote me on that. Jdforrester-WMF removed a project: Beta-Cluster-Infrastructure. Provisionally declaring this a problem with master, not the Beta Cluster. OK, I think this may have been 'just' T107979: [Regression pre-wmf18] VisualEditor doesn't load, throwing "Uncaught TypeError: Cannot read property 'requestPageData' of undefined"; will mark as closed but if anyone can reproduce please re-open. VE now works worked for a while, while logged out on the beta cluseter, however the big spinning "loading" thing is still on beta, and won't disappear. So something still...wrong. Still can't use VE while logged in on the beta-cluster either. The blue loading bar stoppes at the end. I can't repro this; the blue bar stops at the end but I see no JS errors, just an alert() about HTTP 0? So it doesn't look to me like MwEmbedSupport or TimedMediaHandler is involved here, as I can't reproduce the JS error but I can reproduce the blue bar halting. I'm pretty sure this has to do with the failure to reach the restbase server instead. The .js error I see constanly (presents itself with the spinning-thing). On all beta-cluster pages, both while logged in and not logged in. I only have access to this browser (on a Chromebook). The VE-error I didn't see while logged out, thne when I logged in once it has "stuck" with me now. Ok I can confirm VE's working for me on beta labs as well now; it definitely sounds like the VE error was unrelated to the JS error in MwEmbed/TMH. Shall we remove the blocker tags from this and leave the bug open for the JS error? Given the errors were apparently coming from Multimedia code, I worried there was something broken there, like a RL module not being loaded in the right order or whatever. So, where does this leave the JS error in MwEmbed/TMH? Should I wat until the next wmf-release, or file/reopen this task to get that fixed? Does that JS error still occur? Where, and doing what? 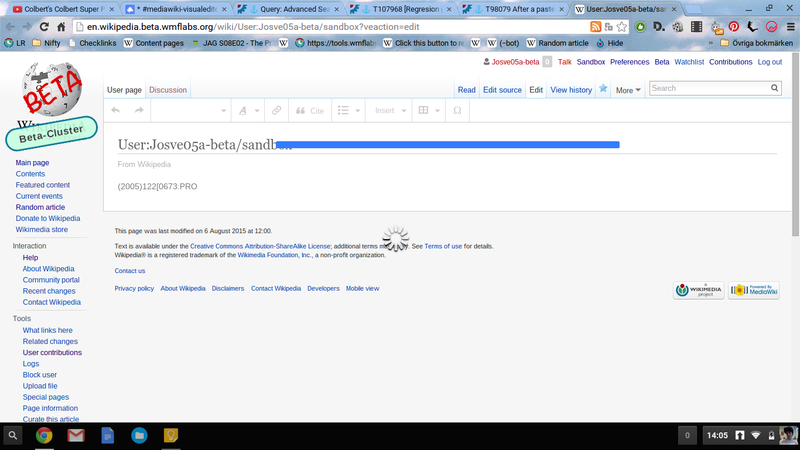 On http://en.wikipedia.beta.wmflabs.org/wiki/User:Josve05a-beta/sandbox?veaction=edit (and for all other pages on the beta-cluster) It has a "spinning" wheel which keeps loading, and the js error pops up in console. Since I'm still experiencing the JS error on beta, and the VE bug was opened as a different task, I'm reopening this task to make sure we have a task for the JS-thing. TheDJ added subscribers: Steinsplitter, Poyekhali, zhuyifei1999, Zppix.